Opalka Tomato has been planted 3 times by Growstuff members. One trellis! Ah ah ah! Since I did end up deciding to plant an Opalka tomato after all (because I went to the Sheep &amp; Wool festival, and someone there sells seedlings), I really did need to get on the ball about finishing at least the trellis that's in that bed. As I previously posted, my beds are 3x8 ft. The trellis is placed one foot in, so something can be planted on both sides, and then there's 1ft left for non-climbing plants. Cut 4 of the pieces of conduit to 8ft long. Hammer rebar into the ground so 1ft remains above ground. You want one at each end of the bed, and then 2 centered with ~1/4" gap between them. Measure the distance from the inside of one rebar to the inside of the next. It's not exactly 4ft. Cut the last piece of conduit so you have 2 pieces, each the length of the rebar gap. Put a corner piece on each long piece of conduit. Carefully lift one of your 4ft-wide sections and slide the tall conduit legs down over the rebar. Do the other. Cut 2 8ft long sections of welded wire fencing. Use your wire to attach one section of the fencing along the top rod of the trellis and down the sides. 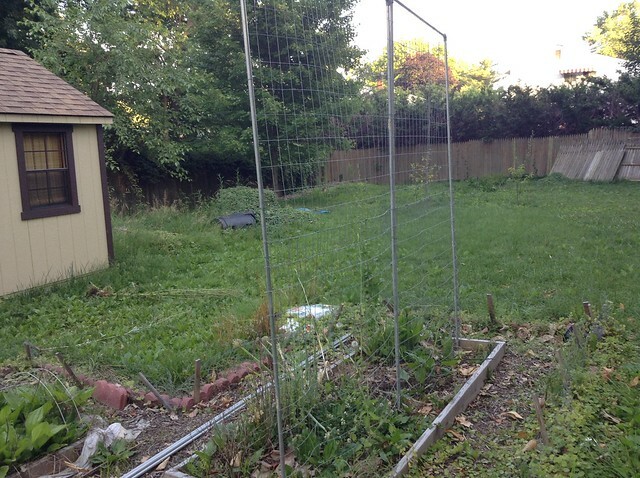 Place the other section of fencing against the bottoms of the legs, and wire it to the sides. Wire the top and bottom sections of fencing to each other. In the center, wrap your wire around both uprights and the fencing to add stability. You could probably attach the fending to the frame before standing it up, but I did the frame like two months ago. You'd still want to lash the two uprights that are next to each other to each other. Why two 4ft wide sections? I didn't trust an 8ft horizontal run without support. And why 8ft tall? Opalka tomato is an indeterminate variety, meaning the vine just keeps growing until winter kills it. Consequently, it very much outgrew my 5ft tomato cages before, and I wasn't too sanguine about 6ft being enough height either. And in other news, we've started picking up 1ft square pavers to redo the paths around the beds, because the mulch paths are full of dandelions. The car can't handle the weight of bringing home enough for the entire garden at once, so the plan is to just pick up a handful on each trip to the garden center. Please ignore all the weeds in this photo. 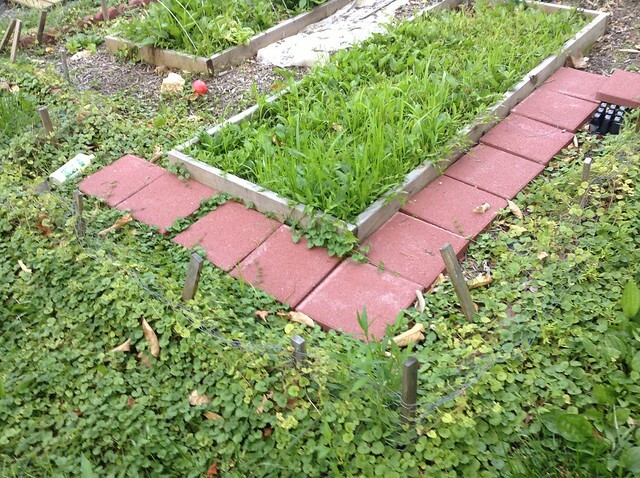 My plan for this year is to work on pavers / building beds / double digging the permaculture food forest, etc. Heavy labor more than actual plants. 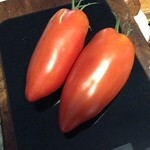 opalka tomato is a variety of tomato. 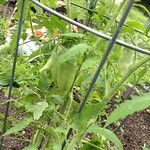 Sign in or sign up to track your opalka tomato plantings. maco harvested 4, weighing 10.2 oz. maco harvested 1, weighing 2.3 oz. maco harvested 1, weighing 1.3 oz. Sign in or sign up to track your opalka tomato harvests.